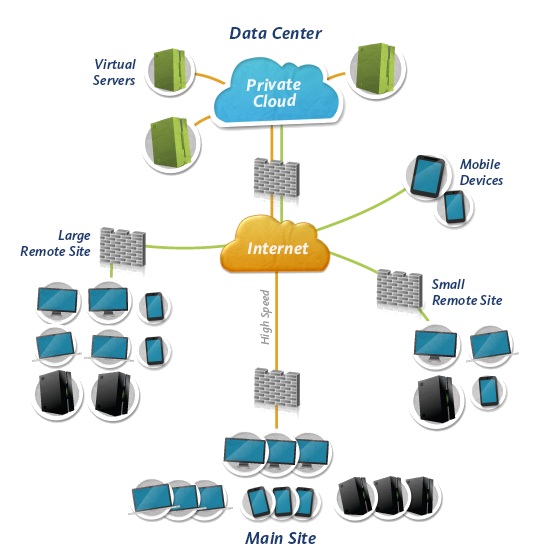 Virtual Server and Application Hosting – All in the Cloud. Growing businesses and enterprises today have ever-increasing needs for more computing power, yet the costs associated with obtaining that added capacity go beyond the purchase of new server hardware. Additional power, facility cooling, network and storage infrastructure, administration, maintenance, and data center upgrades or construction are also part of the equation that can add up quickly. This where the power of server virtualization comes in, and it can have a major impact and huge cost benefit to your business — today. If you are thinking about moving some of your critical or non-critical servers & applications to the Cloud, our VM powered virtual server hosting platform provides a high-performance managed virtual hosting platform for your business. We can migrate existing systems or help you deploy new ones. And we’ll design a cost-effective and redundant private cloud-based virtual network for your business that will provide you immediate benefit. Maintained by our specialist support staff and 24×7 active monitoring systems, we work hard to meet all of your hosted server and application needs. And we’re with you every step of the way. Unlike many providers who offer Do-It-Yourself hosting solutions, our brand of managed hosting always comes with a person to call for issues and support.